"Weedy rice may have evolved a go-it-alone 'cheater' root growth strategy that could allow it to exploit the nutrient-sharing soil environment of rice fields," said Kenneth M. Olsen, professor of biology in Arts & Sciences at Washington University and senior author on a new paper in New Phytologist relating their findings. "We tend to think of competition occurring above ground because that's the part of the plant we see. But that's only half the plant," Olsen said. "It's the 'hidden half'—i.e., the root system—that plays a critical role in some of the most important aspects of plant growth and survival, including water uptake and competition for essential nutrients like nitrogen and phosphorous." "This appears to be particularly true for agricultural weeds such as weedy rice, which compete against crop varieties in agricultural fields," he said. 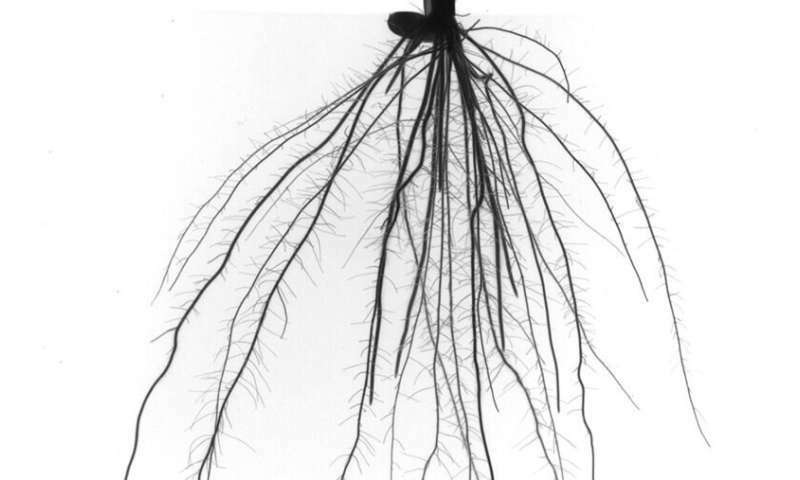 Scientists are only just beginning to get their first realistic glimpses of how root growth and below-ground root interactions affect a plant's ability to compete for resources. In the past, they couldn't get a decent look at a root system without digging it up, which inevitably damages it, or by growing plants in very artificial conditions, such as sandwiched between two glass plates. For this study, researchers compared the roots of two independently evolved types of weedy rice that occur in the same rice fields in the southern United States. Using new imaging techniques, including a semi-automated optical tomography approach developed by Christopher Topp at the Donald Danforth Plant Science Center, the researchers took more than 70 photographs of the root systems of each of 671 different weedy rice plants. Then they modeled the pictures in 3-D to create 360-degree digital maps of their roots. The researchers used a variety of algorithms they developed to analyze 98 physical traits—including root depth, root system width, certain exploratory traits and root-soil angles. They also conducted genetic analyses to track the weeds' separate paths from their domesticated pasts to their persona-non-grata status in the rice fields of today. "Natural selection says that they (the two types of weedy rice) should respond to this environment by evolving similar traits," said Marshall J. Wedger, a Ph.D. candidate in Olsen's laboratory and first author on the paper. "They did evolve similar traits in response to similar environmental pressures, but they did so using very different genetic mechanisms." "By looking at the genetic basis of weedy rice evolution, we can see whether—at the genetic level—there's more than one way to evolve a weed," Olsen said. "What we find, both for aboveground traits and now with this study for belowground traits, is that the answer is a definitive yes." "In other words, it's disconcertingly easy to evolve a weed from a domesticated crop," Olsen said. "This can occur multiple times independently from different crop varieties."